Check here for updates on Clinic Closures and/or for other Announcements. Then scroll down to "Beauty and Wellness". We look forward to continuing to be of service to all who come through our doors. Are you suffering or are you in Pain? To read my bio please click on the following link: bio. Are you aching, in chronic pain, or are you suffering in some way? As an MD and an EAMP (East Asian Medical Practitioner) / LAc I am in the unique position to understand the medicine we all grew up with, but I can also help you to understand how Chinese Medicine can help you feel better. We are focused on wellness here at Blue Waters Acupuncture Center so if one comes to see us we will initially get an overview in detail of one's health situation so we can have a clear picture at the outset of one's current state of health. We are committed to helping people with their health concerns. Knowing where the patient is currently at allows us to create an individualized plan to address ones specific health issues. Acupuncture is not primary care (in Washington State) nor are we an urgent care nor emergency care center. But we are appropriate for most mild to moderate acute or chronic medical problems. We are often able to help in situations where Western Medicine has done its very best to deliver state of the art care, but they have nothing else to offer or don't find anything wrong after a thorough medical workup, but the problem or the pain still exists and persists, or the side effects of the medicine(s) is/are un-acceptable. We can also be quite helpful for most mild to moderate acute or chonic muscle sprains or strains, spasms, or their 'knots' or 'rocks'as many patients call them. In its long history Chinese Medicine dealt with every aspect of human life and dis-ease. Chinese Medicine over the course of 2 millenia understands that emotions can and do affect the physical health of the body and therefore this aspect is addressed where and when appropriate. And by the same token, ills of the body can and often do affect the emotions so this is addressed when involved. Chinese medicine at its best has always considered the person as a whole in which there are many tightly and intricately linked components which are inseparable and to take care of this whole person. It has the capacity to address all health issues as any one issue can and often does affect the others issues. To not do so is like doing a 32 point inspection at your car care center, finding out that the battery is weak, the brake pads need replacing, and one head light is out, and then they only replace the battery. How well is the car going to work then, and for how long? Western Medicine on the other hand, is also powerful in its own right in that it took a reductionistic point of view in seeing each organ as separate and looked at its function from a biochemical/biomedical point of view. If you suffer from chronic pain of any type, fibromyalgia, allergies, depression, anxiety and fatigue; or if you are seeking to lose weight, and live a healthier, more productive and energetic life; we offer a safe, effective and drug free alternative. ﻿If you are unsure about whether we can help your problem, we offer a free 1/2 hour consult where we can sit down together and I can answer any questions you may have so you can make an informed decision about whether you think Chinese Medicine is right for you or not. If you come to our office for a first office visit, we will go through a thorough initial visit to first determine if we are able to help you. We will tell you what is wrong with you from a Traditional Chinese Medical (TCM) point of view. Through-out the first three visits we will go over in detail how TCM works, we will initiate Acupuncture treatment, start a Chinese Herbal Formula, and we will go over how we will evaluate your progress and if appropriate we will lay out a detailed course of action to improve your health with specific goals in mind. For thousands of years Chinese Medicine was the only medicine to treat an entire nation of people, now it still treats 1/5th of the world's population along with the addition of Western Medicine. There are not too many problems that Chinese Medicine cannot help. Why is that? Because your body contains this system of medicine. It comes standard equipment in you. When we use Acupuncture, we are only activating and enhancing your body's own natural healing abilities. You already possess this meridian system in your body even if you are not aware of it yet. So do dogs, cats, and horses to name a few animals. The Qi and Blood that flow thru this system are vital to nourish and maintain all of the body's cells, tissues and organs. 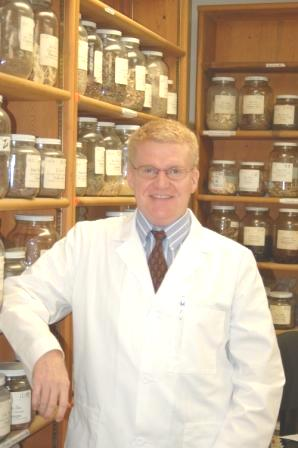 When we use Chinese herbal formulas, these have been fined tuned over 1,000s of years to match exactly each individual patients current issue(s), eliminate pain, root out the the underlying cause(s) from a Chinese medical point of view, improve and restore normal internal organ function, root out early disease - functional disorders. And then once someone is healthy again this medicine promotes vitality, wellness, prevention, increased stamina and faster recovery times by helping all healthy internal organs to remain as close to peak efficiency as possible, and catching any dimished function asap when someone chooses to use us as part of their preventative health care program. The original reason Chinese medicine was created at all 3,000 BCE was longevity. But to get there often one must first get rid of dis--ease, then root out underlying Chinese medical causes, and then move toward prevention and vitality through maintaing optimal internal organ health as noted above to promote longevity. We may also use a variety of other techniques, methods, tips, tricks, when or if necessary, including, but not limited to, Cupping, Gua Sha, Electro-Acupuncture, Micro-Current Positinal Tuina MPT, regular Tuina, Qi Gong or Tai Chi, exercise advice, dietary advice, and Point Injection Therapy. When the flow of Qi is insufficient, unbalanced, or interrupted, illness may occur due to deficiencies, excesses, or blockages, and pain and/or weakness often results. Many diseases have been treated by Chinese Medicine long before Western Medicine (MD - Allopathic) gave them their current recent Western disease name. Boosting the immune system, reducing stress, and enhancing healing. L and I cases (Labor and Industries - Workmans Comp) - LOW BACK PAIN ONLY at present -- we are currently participating in a 2 year pilot project in the State of Washington. You just need to ask your attending medical provider on your L and I case for a referral to us. Call us for more details. If you do not see it on this list, please feel free to call or email us and ask. And again, we do offer a free 1/2 hour consult where we can sit down and talk, and I can provide answers to any questions you have so that you can make an informed decision. I have been a patient of Dr Carruth since June of 2017. During this time I have been receiving acupuncture treatments twice a month I have also been taking Chinese herbs Dr Carruth formulates specifically to help support my vision and strengthen my eyes. The pressure in both of my eyes had been climbing up past normal levels and my eye doctor was very concerned. Normal pressure for my eyes is around 17. My left eye had climbed to 27 and my right eye was at 20. My eye doctor requested I come in to be re-tested for Glaucoma. I had not done well on the Glaucoma test a year ago. She also wanted to discus taking medication to bring the levels down. When I came in for the tests she was very surprised and excited. The levels had dropped from 27 to 15 in my left eye and 20 to 13 in my right eye. I passed the Glaucoma test with flying colors. She wanted to know what I was doing. When I told her I was seeing an acupuncturist and taking Chinese herbs she was so impressed that she asked for the name of my acupuncturist so she could refer her patients to see him. She has many patients who refuse medication due to the side effects and was happy to know there is an alternative method to help them. I hope this testimonial will encourage other people with eye issues (or any health issues) to try acupuncture and herbs. Thank you Dr. Carruth for your help and support on my journey to better vision and healthier eyes. In April of 2015, my daughter, Kathleen, suffered a stroke which wiped out the left side of her brain. 2 days later they removed the left side of her skull so the brain could swell.4 months later her skull was replaced but her progress was slow & still required a wheelchair. She is able to walk & has some sensation in her right arm – all thanks to Dr. Mike! In January of this year we finally have her taking the herbs in capsule-form & what a difference they’ve made! The words just come “tumbling” out! Again, my gratitude for Dr. Mike is unlimited! On Dec. 28, 2017 I had vertigo & neuropathy so bad I could barely walk. My feet were completely numb & my balance was so bad that I required help to walk & used a walker & cane. My circulation was so bad that my legs even lost all the hair on them. My western doc was very good but couldn’t do anymore to help me.I began accupuncture & chinese herbs also. I believe the combination saved me! Today I can feel my feet again, there’s warmth in them, I can walk 95% better, the vertigo is a rarity. My diabetic A1C when I started was 13. Its now at 7. Dr. Mike also taught me to eat healthier & to relax. The hair has grown back on my legs! I feel as though he saved my life! The vertigo & diabetic neuropathy was the most challenging experience of my life but I see light at the end of the tunnel & expect full recovery. It can be dealt with & recovered it, it saved me! Thanks to Dr. Mike & staff for all your help! You’re a blessing in my life! I would like to let everyone know how much acupuncture has helped me. I have had 3 major back surgeries, 2 of them in 2017, and I have been living in a lot of pain, the last two surgeries. My right leg feels like needles sticking me all the time and my back was so painful, I couldn’t even stand up straight without getting spasms, which caused me to be unable to drive or leave my home. I have been on so many pain pills, that I can’t even think straight. And don’t even have normal bowel functions. My life came to a halt. I have always been a very active person, loving ice skating and other activities. It is just who I am. The pain and fatigue made me so tired that all I wanted to do is sleep and stop the pain. So I talked to a friend and she said why don’t you try Acupuncture, it had helped her so much. I started going to Blue Waters Acupuncture Center, Dr Michael Carruth MD in Yelm,Wa. I had my first appointment with Dr. Mike on December 7, 2017 and I was in so much back and leg pain, that I was humped over and couldn’t stand, that all I could do was cry. I continued to see Dr. Mike each week in December 2017 and also each week in January 2018, I can not believe how much better I was feeling by the 3rd week in January. He adjusted my appointments to only have to go in every 3 weeks. It is unbelievable how much my back pain and the inflammation is easing up to where I can straighten up my back and use my leg again in just 3 months. The treatment has giving me hope that I can go back being the person I want to be. 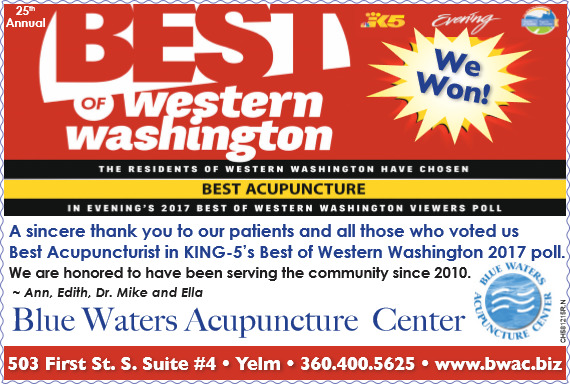 Dr Mike and acupuncture has help restore my life, I can’t thank them enough and his entire staff for all the help they continue giving me ever visit I go to. I would definitely recommend Chinese Medicine, it has been a life saver for me. How Acupuncture helped me: After the delivery of my son who is nowalmost 3, I had several post operative complications that kept me in the hospital an extended period of time. About 6 weeks after the delivery, I started developing constant pain and fatigue beyond anything I had ever experienced before. I saw many doctors that attributed it to my weight, the fact that I had a newborn, and many other things. None of them offered me any help. The pain got so bad that Iwas put on prescription pain medications just so I could function in everyday life. That pain prevented me from being the type of mother that I wanted to be. The fatigue made me essentially non functional at home with my family. At work,where Im a nurse, I was able to perform my job but I knew that the pain and fatigue was preventing me from giving my all. As time went on, the pain and fatigue got worse and there were times when I contemplated suicide because I feltlike there was NO HOPE for me to be normal. try Acupuncture. What did I have to loose? When I started treatment with Mike about 9 months ago, it was the first time in over 2 years that I had hope that anything would get better. After meeting Mike and hearing about energy points, yin and yang, and liver fire, I raised a skeptical eyebrow. It took me a few months before I didnt chuckle to myself when Mike would mention Qui. dramatic fix but it has been a long lasting one. I started to remember the person I was before all the pain and fatigue. I remember being able to watch a movie without falling asleep. I remember when I could shower without the aid of a bathchair because I was in too much pain to stand. I remember this person, I remember ME. I still have days when some pain creeps back in or where Im more tired than usual but my WORST day now would have been a day that I prayed for at my worst. I am so thankful that I found Mike and his office. How Acupuncture helped me: Acupuncture has helped to restore my life. In June of 2007, I had a stroke at the age of sixty-one. It took three weeks in the hospital before I was able to come home. I was unable to return to my job as a teachers assistant in September. Finally in January I had more strength and mobility and was able to return at four hours a day. I had to use a cane and my energy level was low. This continued until Nov. 2009 when I went to my first Acupuncture treatment. 2.Second, give me a call. I offer a free 1/2 hour consult if you so choose so you can meet me and we can sit down and I can answer any questions or concerns you may have. That way you can make an informed decision about whether Chinese Medicine is right for you or not. Or you can call and make an appointment for an initial visit and get started. We accept most insurances. If we do not immediately answer your call on the above days, please leave me your name, call back number, and nature of your call, and if you would like to make an appointment, and we will get back to you as soon as possible. 3.Third, if you would like you may add your contact info. Just click on the following link Contact Us. Acupuncture pain management and relieving suffering is our business and we specialize in providing you withinitial alleviation of your pain and then we work together with you to treat the root cause of the pain from a Chinese medical point of view. And if you are healthy then we can help you stay at your best. Acupuncture can be a part of a preventative health care system. We can help you maintain your best! Come see us so we can help you feel better or stay at your best. On Dec. 28, 2017 I had vertigo & neuropathy so bad I could barely walk. My feet were completely numb & my balance was so bad that I required help to walk & used a walker & cane. My circulation was so bad that my legs even lost all the hair on them. My western doc was very good but couldn’t do anymore to help me. I began accupuncture & chinese herbs also. I believe the combination saved me! Today I can feel my feet again, there’s warmth in them, I can walk 95% better, the vertigo is a rarity. My diabetic A1C when I started was 13. Its now at 7. Dr. Mike also taught me to eat healthier & to relax. The hair has grown back on my legs! Thanks to Dr. Mike & staff for all your help! You’re a blessing in my life! Come see us at the Yelm Home and Garden Show! at the Yelm High School. to check your health status. I have been a patient of Dr Carruth since June of 2017. During this time I have been receiving acupuncture treatments twice a month. I have also been taking Chinese herbs Dr Carruth formulates specifically to help support my vision and strengthen my eyes. The pressure in both of my eyes had been climbing up past normal levels and my eye doctor was very concerned. Normal pressure for my eyes is around 17. My left eye had climbed to 27 and my right eye was at 20. My eye doctor requested I come in to be re-tested for Glaucoma. I had not done well on the Glaucoma test a year ago. She also wanted to discus taking medication to bring the levels down. When I came in for the tests she was very surprised and excited. The levels had dropped from 27 to 15 in my left eye and 20 to 13 in my right eye. I passed the Glaucoma test with flying colors. She wanted to know what I was doing! When I told her I was seeing an acupuncturist and taking Chinese herbs she was so impressed that she asked for the name of my acupuncturist so she could refer her patients to see him. She has many patients who refuse medication due to the side effects and was happy to know there is an alternative method to help them. Thank you Dr Carruth for your help and support on my journey to better vision and healthier eyes. We will answer all calls and emails when we are back in the office on Monday, September 8th.